What Is an F4V File? A file with the F4V file extension is a Flash MP4 Video file, sometimes called an MPEG-4 Video file, that's used with Adobe Flash and based on the Apple QuickTime container format. It's similar to the MP4 format. The F4V format is also similar to FLV but since the FLV format has certain limits with H.264/AAC content, Adobe developed F4V as an upgrade. However, F4V doesn't support some of the video and audio codecs in the FLV format, like Nellymoser, Sorenson Spark and Screen. F4P is another Adobe Flash format but it's used to hold DRM protected MPEG-4 video data. The same is true for Adobe Flash Protected Audio files that use the .F4A file extension. Many programs open F4V files since it's a popular video/audio compression format. 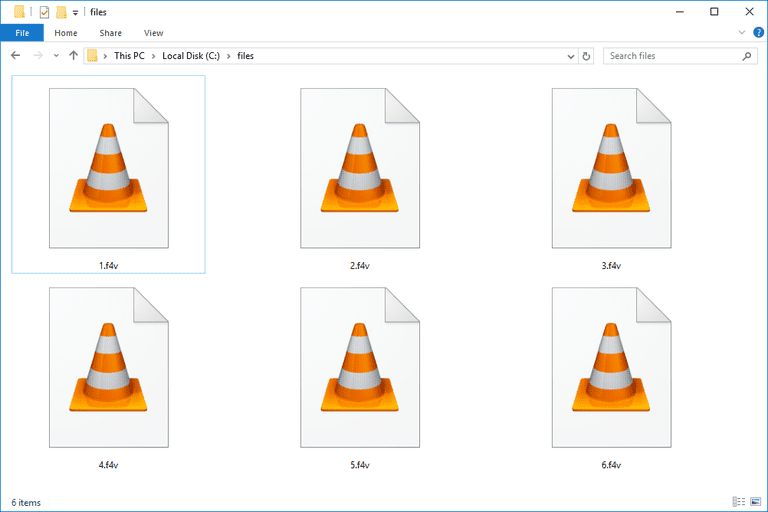 VLC and Adobe's Flash Player (as of Version 9 Update 3) and Animate CC (previously called Flash Professional) will open F4V files, as will the Windows Media Player program built into some versions of Windows and the free F4V Player. Many other standalone programs from other developers will play F4V files too, like several Nero products. Adobe's Premiere Pro video editing software program is able to author F4V files, as are other popular video editing and authoring suites. If you find that an application on your PC does try to open the F4V file but it's the wrong application or if you would rather have another installed program open F4V files, see our How to Change the Default Program for a Specific File Extension guide for making that change in Windows. Look through this list of free video converter programs to find one that supports the F4V file format, like Any Video Converter. You'll be able to use one of those tools to convert F4V to MP4, AVI, WMV, MOV, and other formats, even audio ones like MP3. You can also convert F4V files online with websites like Zamzar and FileZigZag. The downside to converting the file this way is that you not only have to upload the video to the website before you can convert it, but you also have to then download it back to your computer to use the new file - both the upload and the download process might take quite a while if the video is large. Some of the supported files that can be contained in the F4V format include MP3 and AAC audio files; GIF, PNG, JPEG, H.264 and VP6 video types; and AMF0, AMF3 and text data types. Supported metadata information for the F4V format include text track metadata like a style box, hypertext box, scroll delay box, karaoke box and drop shadow offset box. You can read much more about the specifics of this file format in the "F4V Video File Format" section of the format specification PDF from Adobe. Is Your File Still Not Opening? If you can't open or convert your file, it's possible that you're misreading the file extension. Some file types use a file extension that is spelled a bit like "F4V" but that doesn't mean that they have anything in common or can open with the same software programs. File Viewer Plus Batch Presets files use the FVP file extension and even though the letters are similar to F4V, the two file formats are unique. FVP files are used with File Viewer Plus. FEV files might be FMOD Audio Events files used with FMOD software, or FLAMES Environment Variable files related to the FLAMES Simulation Framework, neither of which are related to an Adobe Flash video file format. Like what's mentioned above, F4A and F4P files are Adobe Flash files as well but those file extensions might also be used with programs that are unrelated to Flash. It's important, then, to make sure that the file you have is related to Adobe Flash in some way. Otherwise, you're dealing with something entirely different and the programs mentioned on this page are probably not the ones you want to use to open or convert your file. What's a 3GP File and How Do You Open One? What's a WVX File and How Do You Open One? What's an MP4 File and How Do You Open One? What's an M4P File and How Do You Open One? What's an MOV File and How Do You Open One? What's an MP4V File and How Do You Open One? What's an M4R File and How Do You Open One? What's a DVDRIP File and How Do You Open One? What's a DAT File and How Do You Open One? What's an AV File and How Do You Open One? What's an M2V File and How Do You Open One? What's a WRF File and How Do You Open One?